Open the Terminal environment from the Utilities (Go >> Utilities from top menu and then select Terminal). In OS X, it is possible to get root access by activating the root user account with dsenableroot. Improper use of this command can open up your system to security issues, however. It’s safer to use sudo (superuser do) on the individual commands or temporarily switch users with sudo su –. For more information on working with the root user, see https://support.apple.com/en-us/HT204012. You can activate Apache simply by issuing either of the the following commands in the Terminal. If everything is working, you should get a simple white screen with the heading “It works!” indicating that the web server is up and running. 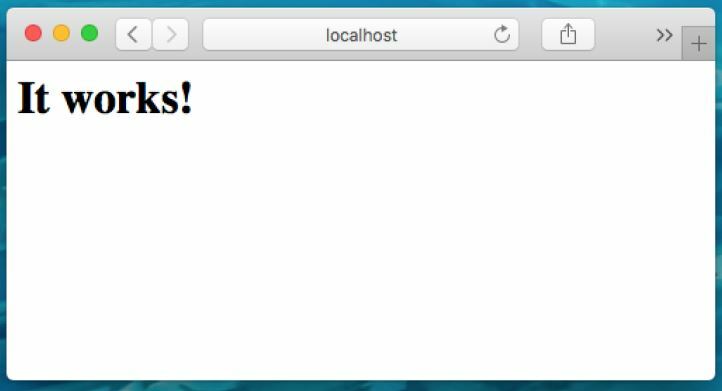 You can determine if Apache is running on OS X by navigating to http://localhost. The Apache configuration file (httpd.conf) must be changed to load the necessary PHP module so that PHP pages can be served up. This is easily done from the Terminal. First, you will need to change to the Apache directory and you should make a backup of the file. To edit the file, you can use the command line editor vi or the Mac TextEdit program, either of which can be opened from the Terminal. If you’re not familiar with vi (pronounced “vee-eye”), it’s a powerful command-line editor common to UNIX-based systems and you can read more about using it on the University of Washington’s site at https://www.washington.edu/computing/unix/vi.html. If you choose the TextEdit command from above, the TextEdit program will open outside the Terminal and will load the configuration file for you to work with. Remove the hashtag (#) from the beginning of the line to un-comment it and then save the file. You will then need to restart Apache with the following command. Save the file with the name phpinfo.php and then load the file in your web browser. If everything is working, you should then get the PHP settings screen. Creating a PHPInfo.php file to display the configuration page is a standard way of testing PHP. The latest versions of MySQL Community Server are available in TAR and DMG format from http://dev.mysql.com/downloads/mysql. I recommend the DMG format which is a disk image that can be mounted as a drive accessible from your Desktop. MySQL Community Server can be downloaded from the MySQL site as a DMG image file. The image file contains a single PKG file which you can double-click to run the installation wizard. As of this writing, the latest version, 5.7.11 is labeled for OS X 10.10 but I was able to install it with no problems on El Capitan (10.11). During the installation, you will be asked to create a password for the root MySQL user – make sure to write this password down somewhere safe! After the installation is finished, it’s a good idea to add the MySQL program directory to your PATH statement so you can run it from any directory. Use the following line in the Terminal to do this. Then, try logging in to your new MySQL server as the root user. 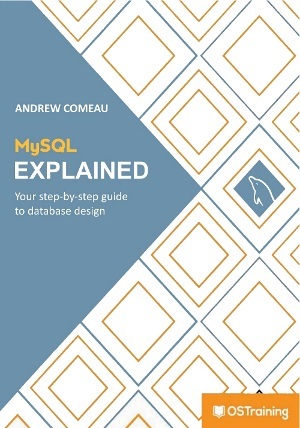 Logging in to and exiting from MySQL. Enables you to change the root password that was chosen during installation. Provides the option to remove the anonymous MySQL user. Provides the option to disable remote logins. Allows you to remove the test database and access to it. Now that MySQL is working, it needs to be able to work with PHP. This is done by creating a link to the MySQL socket file which will allow PHP to communicate with the server. 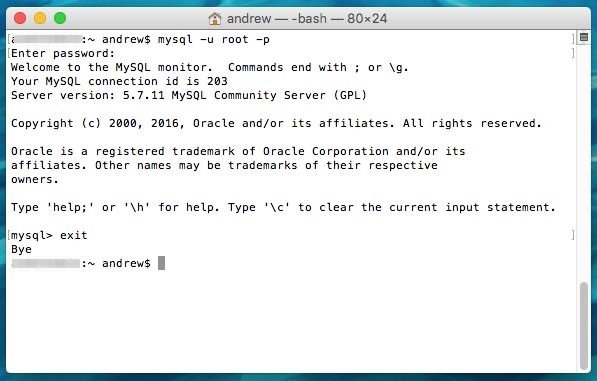 Entering the following commands in the Terminal will create a new MySQL directory in the system Var directory and a symbolic link in that directory to the socket file. When the MySQL installation is finished, you should be able to Access the MySQL preference pane shown in Figure 2.11 from the System Preferences panel. 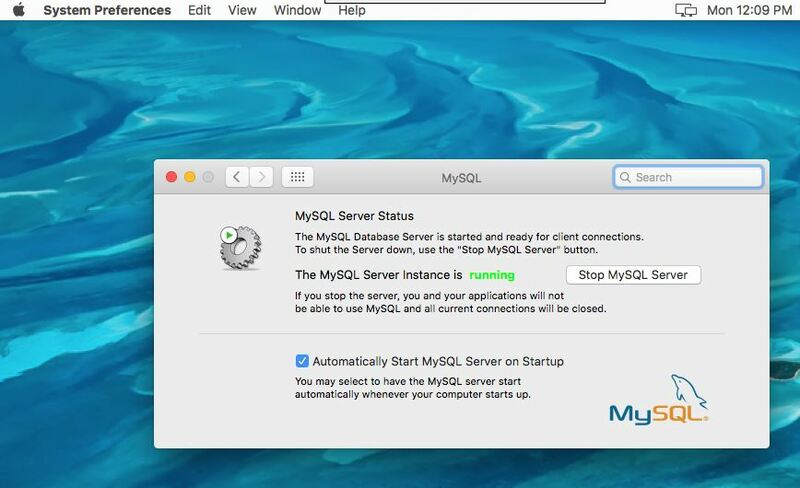 This pane enables you to start and stop your MySQL server and set it to start when the OS starts up. You probably won’t want to manage all of your databases from the Terminal and OS X supports some of the same graphical tools as Linux and Windows. 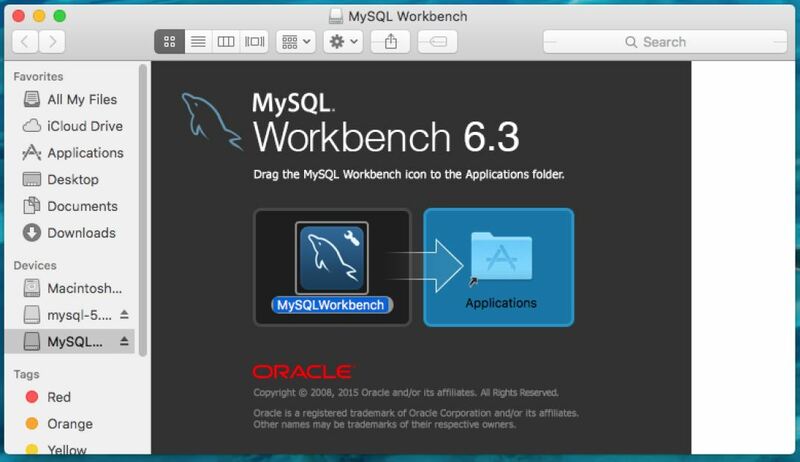 MySQL Workbench is available from http://dev.mysql.com/downloads/workbench as a DMG image file. Installing Workbench is as simple as opening the mounted DMG image and dragging the MySQL Workbench icon to the Applications folder when prompted. You will then be able to run the program from your Applications folder. As a PHP application, PHPMyAdmin can also be installed within your new AMP environment, regardless of the operating system. Download the latest version from PHPMyAdmin.net. The package is available in ZIP format. UnZIP the files to a PHPMyAdmin subdirectory under your Localhost folder, usually \Library\WebServer\Documents. Copy the config.sample.inc.php file to config.inc.php and open the new file for editing. Look for the line that starts with $cfg[‘blowfish_secret’] = and add an encryption value of your choice. This value can be a series of random letters and numbers if you like. If you would like to have a default user and password for phpMyAdmin, you can add the following lines to the $cfg['Servers'] section of the file, substituting your own values for the user name and password. Once this is done, you should be able to run PHPMyAdmin simply by navigating to http://localhost/PHPMyAdmin. For more information on installing PHPMyAdmin, see the documentation at https://phpmyadmin.readthedocs.org/en/latest/setup.html.